“Everything I have, I owe to pasta,” Sophia Loren is supposed to have said. Pasta has gotten a bad reputation of late. Maybe “bad” is the wrong word, but once the carb control revolution caught the collective consciousness, pasta sort of fell by the wayside. Which is a shame. Remember that great scene in “The Object of Beauty” when an almost destitute John Malkovich asks Andie MacDowell what spaghetti is made from and how much the dish in front of him could have cost to prepare? And then he asks why he is paying the equivalent of the GDP of a small third-world nation for a meal whose ingredients cost about USD$1.75? “Is the wine expensive?” asks MacDowell. Judging by the state of our collective stock portfolios, it may be time to revisit the humble bowl of nourishing comfort food that saw many of us through the early years. Besides, with what you’re saving on the dinner, you can afford that slightly more expensive bottle to go with it. Since it’s spring and the asparagus and the peas are tender and young, and in the hopes of creating another Sophia Loren, what better time to fix a delicious Pasta Primavera? This is an extravagant recipe — the ingredients are the freshest of the season, and each vegetable should be prepared separately to ensure that they remain crisp and brightly coloured. 1 1/2 cups of fresh, small green peas, shelled. Petit pois… the smaller the better. 1 1/2 cups of fava beans, shelled, or tender young green beans cut into 3/4″ lengths. Warm a serving dish in a low oven. Prepare a small pot of boiling salted water and a large bowl of ice water. Slightly undercook each vegetable separately. As soon as they have a shockingly bright colour, drain them and plunge them into the ice water bath. Let them sit for a couple of minutes to stop them from cooking. Drain and roll up in a kitchen towel to dry them off a bit so they don’t spatter as much in the butter. Boil a large pot of salted water for the pasta. In a small skillet or fry pan, melt the butter. When the water is boiling, add the pasta. Sauté the vegetables in the melted butter for two minutes, stirring constantly as you would with a stir-fry. Add the cream and pepper. Stir and heat gently — do not boil. Drain the pasta and pour it into the serving dish. Add the cream and vegetables and the parmesan cheese and toss to coat. Serve immediately with a bottle of Pinot Grigio. This entry was posted in Entertaining and tagged "The Object of Beauty", Andie MacDowell, Cary Grant, John Malkovich, Pasta Primavera, recipes, Sophia Loren, Spring. Bookmark the permalink. Yummmm! Dimples…and you cook, too! What a fantastic photo of two icons! Mmm, and the recipe sounds marvelous. I love your blog, and just added it to my list. I’m gonna stroll through it this weekend! Leave it to Sophia to give pasta a good name. Pasta? Never gave it up! I agree with Mr. Peacock, what a wonderful photo. i am trying this recipe. CG is pretty yummo too. 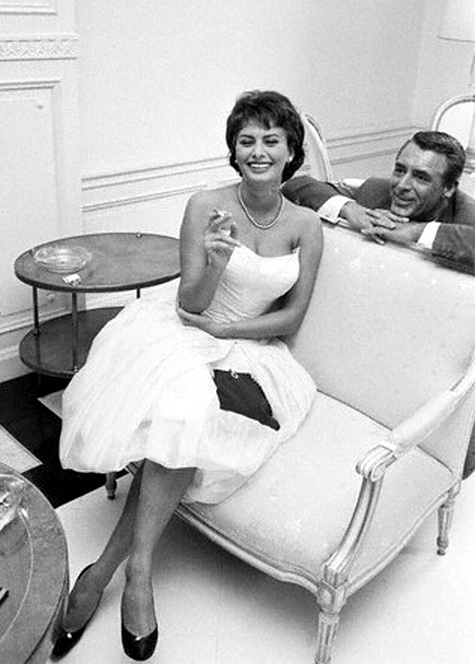 What a classic picture – and I’m happy to see Mr. Grant in the background. What a character. The recipe sounds out of this world.